No matter how healthy your smile is, it’s likely your teeth are more of a dingy yellow rather than the shades of white we all had when we were kids. Many different factors can lead to tooth discoloration, such as eating and drinking habits, tobacco usage and even aging. You can brush and floss daily and still end up with yellowed teeth – which is one of the many reasons teeth whitening has appeal. 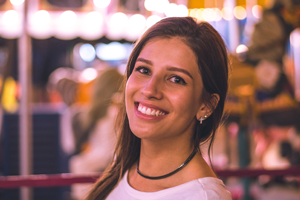 There are many different misconceptions surrounding the dental procedure of teeth whitening and how risky it can be for a patient. MYTH 1: Teeth whitening is dangerous. Tooth whitening is a safe, popular cosmetic dentistry option. The bleaching, or whitening of your smile opens up the internal channels of the tooth which can lead to some sensitivity. Short-term side effects of tooth whitening include tooth sensitivity as well as gum or tooth pain. As a precaution, whitening is not recommended for women who are pregnant or nursing. MYTH 2: Teeth whitening is harmful to enamel. There is no evidence that the enamel of teeth is harmed during a whitening procedure. The whitening or bleaching of your teeth does not change the surface of your teeth or make them any softer. MYTH 3: Teeth whitening isn’t useful. Tooth whitening is successful in at least 90 percent of patients, according to the Academy of General Dentistry. The treatment is ideal for patients with yellow tooth discoloration. Patients with brown or gray discoloration may want to consider alternative treatment, such as porcelain veneers. MYTH 4: Teeth whitening is bad for teeth in the long term. Done properly, teeth whitening is not dangerous for you or your teeth over long periods. However, anything that is done in excess (from exercising to eating) can be bad for you, and this also applies to teeth whitening. Overuse of whiteners can be very damaging to your teeth and gums, so be sure to follow directions or speak with your dentist about in-office whitening options. Dentistry at East Piedmont helps patients get radiant smiles every day. If you’d like to begin your journey to whiter teeth today, feel free to contact our office and ask about Zoom!® Whitening and our other tooth whitening options.